It’s been two weeks in a row of unsatisfactory new meats leading into this week- week 21. I was slightly nervous, especially because Tom the butcher had sourced some seemingly hard to come by Veal Sweetbreads. The thought in my head instantly is: can I redeem myself and cook a top notch and tasty meal for my weekly meat with a complete unknown? It’s about time I did! I’ve never done sweetbreads of any sort before. Dad had talked about lamb sweetbreads when I was younger, and Tom had mentioned them being a French delicacy. That’s pretty much all I had to go on. Tom then introduced them to me last week and I fried one small one up in what appears to be an Argentinean style, this being simply salting and frying. It was only a mouthful really, but was a nice one and left me with hope that getting an entire meal worth a few days later could be a secret little masterpiece, yet to be experienced but long to continue. I hadn’t ordered these into the butchers, but the opportunity seemed too good to pass up, so I grabbed it and took in some of the French recommendations from Tom. The Argentinean attempt was incredibly simple and seemed pretty good, however, it was but a taste. So I decided to seek out a more French recipe for this, which generally involves soaking, poaching, chilling, removing membranes and frying. Basically- more work. This is where the logical (very prominent) part of me was lost to the idealistic part, and I thought to myself- “you know what, let’s do the long way and see how it goes. The French have mastered a few things- cheese, wine, little moustaches- so trust them on this”. Sometimes I don’t know why I talk to myself like that, I’m obviously going to agree, it’s me saying it! Maybe I should have extended the conversation a bit this time, as it did take a big chunk of my afternoon. I left them for a couple of days until ready to cook them and decided on a recipe that followed the general principles of salting, poaching etc. One of the weird parts of this is to cool after poaching by putting into the fridge whilst being squashed or pressed down to flatten out somewhat. To what degree I’m still essentially clueless. So I set about soaking for a few hours. The sweetbreads, not myself. I kept checking on them nervously like something drastic was going to happen. Not much did, apart from some time went by and they ever so gently ‘cleaned’ themselves. Once clean and rinsed they needed to be gently poached in not quite boiling salted water for about 20 minutes. This was the interesting part, as I kept going from computer (I seem to spend a lot more time here these days) and kitchen. Who knows exactly how hot that water should be? Heaps of people I bet, but I didn’t, I guessed and watched intently as the water grew murky and the fat on the meat solidified and a distinct smell hit the room. 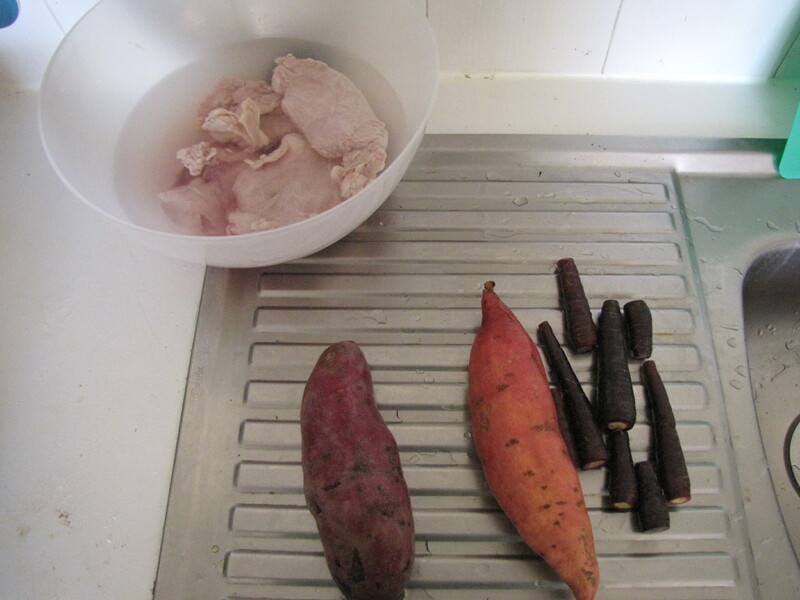 At the same time I was slowly preparing some root vegetables in order to make a mash/hash dish. This was going to be a first also, but I had adapted a recipe and added some vibrant colour to what can be a same same dish with good old spuds. 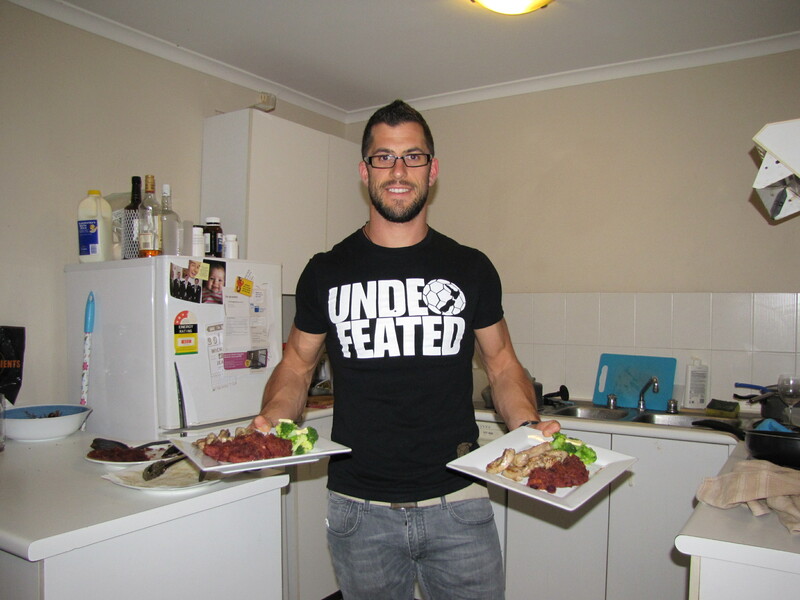 I had peeled and chopped 1 medium purple kumara and 1 medium golden kumara as well as a small handful of baby purple carrots. These boiled to soft, I smashed them up a bit and left to sit until the dish was nearing completion. This was now the time I improvised with pots and pans to make something suitable for the sweetbread squash. 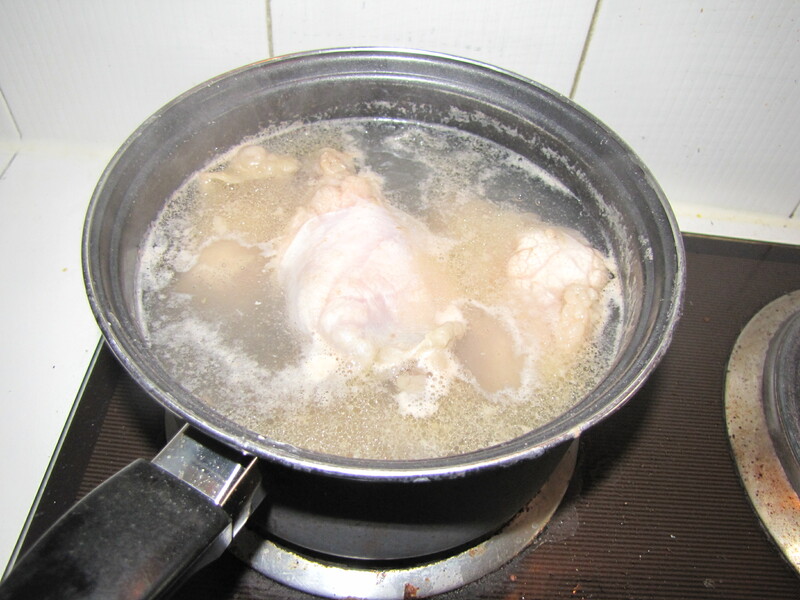 I know that sounds like a strange vegetable or a 1950’s style dance, but it was in actual fact a delicate operation that involved a pot full of water sitting on the poached sweetbreads to weigh them down and then very precariously placed in the fridge to do their thing. Which was, to my best guess, cool and flatten out. I left roughly an hour for this before removing, carving into small slices and seasoning with rock salt, pepper and fresh lime juice. At this point I began to make the colourful hash. This required some bacon chopped into small pieces then fried in some ghee, once browned I added some fresh garlic, let the two infuse before adding ¼ of a cup of apple cider vinegar, stirring and adding the smashed up kumara and carrot mixture. This failed to crisp up like I had envisioned so I removed, placed under the grill and got the pan ready for the main show. I got the pan hot, added a small amount of duck fat and introduced the meat in a moment of realisation that this is pretty similar to the lambs brain and testicles, both in terms of appearance and cooking technique. No one to trick into eating it this time though! NN was in attendance, starving and looking forward to it. I too was starving but also a touch apprehensive about how the finished product would turn out. Would it be a storming success as I had earlier hoped for, or would it be a disappointing endeavour, much like I’m sure someone moving to northern Scotland hoping for tropical weather would discover upon spending a few days there? Time to see. I had snap steamed some broccoli and dressed with a small amount of organic butter. The hash had crisped a touch and the colour was an interesting dark purple. I then dished up the now fried and brown pieces of veal sweetbread. The plate was complete and so was my hunger. In we went! Only a few days had passed since I tasted the small amount of simply prepared Argentinean style sweetbread but I had already effectively forgotten the taste as a comparison. This seemed different, but it was hard to pin point. Either way, to me, it left a distinctive after taste in the mouth that I didn’t find overly enjoyable. Some of the bigger pieces had more of a mushy aspect to them, which wasn’t amazing eating, but the smaller, crispier pieces were quite delightful. NN loved these parts and overall the sweetbreads grew on her. I was still left with the same lingering taste that leant more to me rating this as ok but not spectacular. The broccoli was, well, broccoli. Simple and buttery. The hash on the other hand I was enthusiastic about trying. It’s tough to add bacon to something and it not be a hit, and this wasn’t lost here. It did carry the distinct flavour of the apple cider vinegar, but the kumara and carrot mash was bettered by the bacon and garlic. Overall I demolished the meal, but still left somewhat unfulfilled by the veal sweetbreads. It might have been how I did them, but I followed pretty closely to the recipe I used, I just think the French like eating some things more than the rest of us… The Argentinians on the other hand keep it simple, less is more in this situation perhaps. Definitely I would. I’d try them at a good French restaurant to see how they do them and if they can be better, because I do have to face the fact that I’m not the world’s best cook, as the last 3 weeks is proving… Plus I like to cycle through protein sources on a regular basis, and these are jammed full of protein, as well as being a great source of vitamins A & C, iron and calcium. If someone has a recipe or an experience with sweetbreads, veal or otherwise, then please share. Get over to my facebook page and let’s see if my episode with sweetbreads was exceptional or, like Justin Bieber-esue forehead sweep fringes, actually quite common. Please keep sharing this blog around and communicate with me and all the other readers if you have questions or something to share! My high-school football coach once told me “Al, if god had intended for us to eat vegetables he wouldn’t have created bacon”. Haha, and did you make it past playing High school football Bundy?? Vegetables are crucial, especially for long days in the womens shoe store, you need those vitamins buddy!